Confessions of a Fabric Addict: Can I Get A Whoop Whoop? Not Finished, But Coming Along! Can I Get A Whoop Whoop? Not Finished, But Coming Along! This week has just flown by! Friday is here already, and you know what that means - it's time to get our whoop whoop on!!! Let's see what everyone's been up to this week! And then, because I had a few minutes before I had to cook supper, I put some of the blocks up on the design wall so I could see what it is going to look like. The colors aren't true here, but I think it's going to look really pretty! Tomorrow I should be able to get the top pulled together, and maybe the back, too. Oh, and one more thing I'm whooping about - we currently have 176 people signed up for Hands2Help!!! That. Is. Amazing!!!! In honor of this girl's 6th birthday! Just something that's making you happy this week! Whoop, whoop! Love that pattern - and to hear how many have signed up for Hands2Help is awesome! Ohhh... 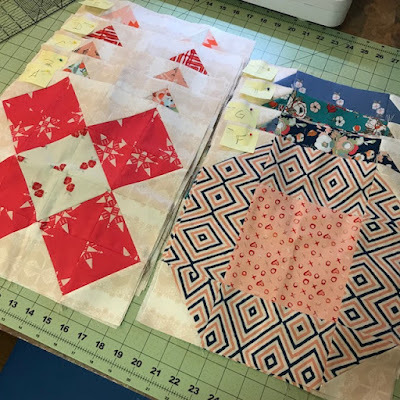 I have had to do the same on a pattern I was writing and forgot the fabric was directional: I had to piece the fabric to have enough for a few missing blocks! Love how the blocks turned out for your quilt! I have pieced a bit of fabric to fix a mistake (usually mine, not the patterns tho!) and it can hardly be detected. Nice set of blocks Sarah! The kid's look so happy. It's really fun to see how much they have grown. Getting all the blocks made is definitely Whoop worthy, especially when you had to do some improvising! Whoop whoop!! That top is going to be beautiful!! Great job. The blocks look great. Well done. Oh I do like it.....very much! Excellent job! Hi Sarah, I love this commissioned quilt. A pattern with a mistake is truly frustrating. Glad that you were able to figure it out, though. Enjoy your vacation next week. Yes - whoop! Whoop! Gorgeous pattern! BTW, I'm sorry, I put up my link twice - please delete the duplicate if you can! Thank you! 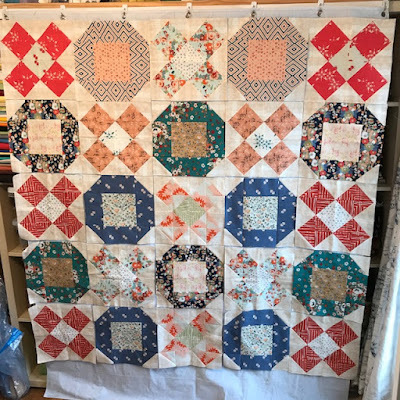 Thank you for hostng and sharing such a pretty quilt! I'm glad to see I'm not the only one who isn't afraid to use some not-my-fault fabric. Nobody could find it if they tried once it's quilted. Can I Get a Whoop Whoop? Mermaid in the Middle! Scraps make Great Donation Quilts! I May Have A Scrap Problem... HST Progress! Make-A-List Monday - Getting Ready for Vacay! Make-a-List Monday - Moving Right Along! Hands2Help - Meet the Sponsors!